Masterchef used to be a sort of twee little show where housewives and gay men competed to create overly frilly dinner party fare whilst Lloyd Grossman unctuously slid around the set with a slightly bemused looking professional chef in tow. The re imagining of the show has turned it into a professional sport. A sort of UFC with chef's whites. Nowhere on the planet could such a proposition have reached more fertile ground than here in Australia. I can't really stress how big the show is here, it's the X-Factor with mis-en-place, a TV event so important they moved the only live prime ministerial debate of the upcoming election so it wouldn't clash with the final. In fact, I have the suspicion that they really ought to have made the debate a mystery box challenge to guarantee the viewing figures. Masterchef in the UK is pure silliness but compelling viewing. The contestants are hungry, yes, but there's is a sort of knowing nod to the pantomime nature of Wallace and Torode. They are like two spoon sucking cockney villains who can barely hold a knife and fork and you'd half expect them to launch into a "this souffle's not cooked, you muppet!" or a "You mug! you don't put cream in moules marinieres, I should give you a slap, you numpty" before bundling the losing contestants into the back of a transit van. In Australia, they've upped the ante. Firstly, the final was based on points, including a quiz where the contestants had to name the cheese or exotic fruit. I quite liked this development, as it let us play along at home and added the excitement of contestants needing to make up points in the "identify the sauce round". Secondly, they have three judges. Two in the Wallace and Torode mould. The cheeky, ever so slightly wacky restaurateur and fashionably bald George Calombaris and the rather camp, cherubic Gary Mehigan. They gurn and shake their heads and try and imbue the opening of a pressure cooker with as much drama as the moon landings. 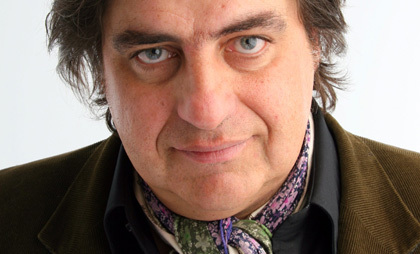 However, the ace in the hole is the lumbering form of Matt Preston. This wet rubbery lipped Miss Piggy in a cravat is a joy to watch. Dainty in a way that only an immaculately dressed man of considerable size can be, he's the Simon Cowell of the show, with exacting standards and questionable table manners. Another interesting change is that Masterchef is on a commercial network here in Australia. This means that every advertiser under the sun is allowed in on the act. A supermarket sponsors the pantry proclaiming "if you want to cook like a Masterchef cooks, shop where a Masterchef shops"displaying the sort of logic that a febrile seven year old would use to get his parents to buy him Batman pyjamas. Given that this is event TV of the highest order it's inevitably a feeding frenzy, overshadowing the World Cup and forcing the coverage of the Tour de France to include recipes. So what does it say about Australians and food? Not a great deal, I think. As in the UK, this is cookery competition and popularity contest folded together, it's about winners and losers and there's nothing more Australian than that.